It's been another week of "secret sewing," so I have no quilt finishes to show you. But I did finish knitting a "Hats for Sailors" beanie! 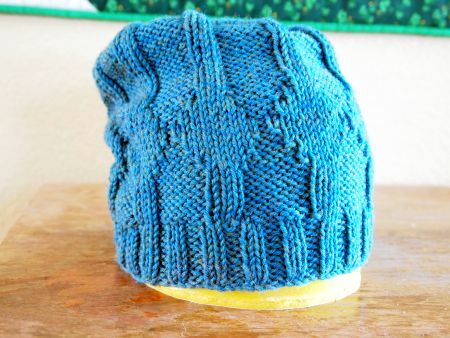 16 Hats in 16 days -- my Ravellenic project during the 2012 Summer Olympics. I announced my goal to knit one hat per day for "Hats for Sailors." Then I found out how many days the Olympics continued. So I was committed to knitting one hat per day for 16 days! I met my goal, but my hands and wrists were out of commission for days afterward! The book is from Leisure Arts, available at JoAnn and other "big box" craft stores. It's a pretty fast knit, but more interesting than my standard Navy Watch Cap. The yarn is Cascade 220 Superwash. Of course, I tossed the ball band, so I don't know the color. It's more green than the photo shows, reminds me of the ocean. "Hats for Sailors" knits hats for sailors on selected ships each year. Thus far, knitters have donated more than 1600 handknit caps to Sailors! Go here to find out more, look at the free patterns, and find out where to donate your handknit hats. Linking up to Thank Goodness It's Finally Finished Friday at Quilt Matters, and Link a Finish Friday at Richard and Tanya Quilts. Have you commented on this post for a chance to win a PDF copy of Deb's "Dishcloth Diva" book? It's a great way to get started knitting! I love those slouchy hats! A much more reasonable goal this year, I think! One a month sounds a lot easier on the fingers and wrists! It looks great. Book Review -- and a Giveaway!